As you may know, each year stands the Enterprise 2.0 summit (2013 : 21st and 22nd of march, save the date) in Paris, the main european conference on enteprise 2.0. 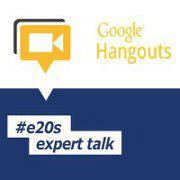 This year to prepare it, Bjoern has the right idea to organize some hangouts with the Enterprise 2.0 / Social Business experts of the summit (#e20s). Yesterday, I was participating to the hangouts about Success factors for Employee Engagement, with Susan Scrupski, Luis Suarez and Greg Lowe. Enterprise 2.0, a new cycle ? Ce contenu a été publié dans enterprise 2.0, management 2.0, Post in english par Anthony Poncier, et marqué avec #e20s, Bjoern Negelmann, engagement, enterprise 2.0 summit, entreprise 2.0, expert, Greg Lowe, Luis Suarez, management 2.0, social business, Susan Scrupski, talk. Mettez-le en favori avec son permalien.